The process of artistic creation of the multimedia opera Amazonas: Music Theatre in Three Parts was expounded by Laymert Garcia dos Santos in the conference “Myth and Technoscience in Cross-Cultural Amazonia,” held on Monday, April 20, as part of the program of theIntercontinental Academia (ICA). The opera is the result of an international and cross-cultural cooperation effort involving Brazilian researchers, German artists and Yanomami Indians from the Watoriki settlement, on the border with Venezuela, and chronicles the future of the Amazon forest both from a Western, technoscientific perspective and from a shamanic, mythological viewpoint. 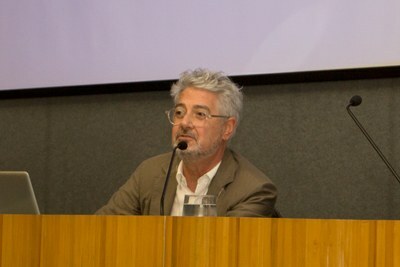 According to Santos, a professor at the Sociology Department of the State University of Campinas (UNICAMP), the aim of this artistic experiment was to bring together two distinct visions of the future of the Amazon rainforest – one based on magical thinking, the other on rational thought – and find common ground on which produce the piece. The opera was produced from 2006 to 2010 in a partnership between the Goethe Institute, the Munich Biennale, the ZKM Center for Art and Media in Karlsruhe, and the Hutukara Yanomami Association, and was presented in 2010 at the International Festival for New Music Theatre of the Munich Biennale and at SESC Pompéia, São Paulo, and in 2013 at the Out of Control Festival in Vienna (Austria). To achieve this synthesis between shamanic and technoscientific cosmologies, a cross-cultural dialogue was established between the Indians and the “white man,” based on a symmetrical relationship and mutual respect. “It was necessary that the two visions converse and preserve their essence, without one submitting to the other. The idea was to integrate, not erase the differences between them,” he said. 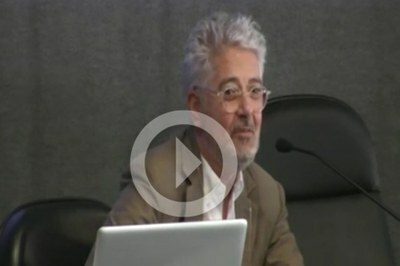 The speaker compared the process of creating the opera to that of establishing the ICA. According to him, both initiatives involve bringing together players from different cultures and integrating their cosmologies, perspectives and worldviews towards a common goal. “It is not a matter of overcoming misunderstandings, but of turning them into productive misunderstandings,” he said, paraphrasing the French anthropologist Bruce Albert. With a soundtrack of urban noises, this introductory section refers us to the past, more specifically to the perspective of the first discoverers of America. But it takes place in the future, at a time when the forest has been totally devastated and no longer exists. According to Santos, “Tilt” shows that the future of the forest was sealed in the distant past, with the arrival of the Europeans. The “white man,” embodied in Raleigh, would be the spokesman for the coming destruction. The last part, “Amazonas Conference,” is divided into three scenes: 1) “Paradise,” which uses mathematical data and models to explore the biochemical processes that ensure the equilibrium of ecosystems and biodiversity at the molecular level; 2) “Conference,” where scientists, politicians, shamans and economists discuss the future of the forest and reach the conclusion that it’s too late to stop the devastation; and 3) “Entropy”, which tells of the collapse of paradise, as announced by the Yanomami and by westerners, with the destruction of molecular chains essential to nature’s life cycles, and of the resulting destruction of the forest. In Santos’ assessment, the opera reveals that, although modeled on very different types of logic, shamanic cosmology and technoscientific rationality are in agreement about the future of the forest: given the current rate of deforestation, the end is inevitable. “This is a death foretold,” he noted.